First of all, the Theatre Nervosa one-man show, featuring A.J. Magoon and directed by John Schneider, has a whole smorgasbord of themes – growing up, love, defining time, things we’ve thought a lot about or never – all told in a meandering monologue that rides waves of quiet self-reflection to fist-waving anger. It is a self-assessment, a societal assessment, a call to action … or inaction. There is no doubt it leaves the audience teetering on the edge of understanding, yet questioning. But my main take-away from the show is the question of just how each of us uses the time we’re given on this earth. About halfway through, Thom asks: “What if you had a day to live? 40 years?” Perhaps it is a question we have asked ourselves, but we never take the time to answer. Instead, we move on to the next inane thought and that all important question fades away. In this case, Thom muses shortly after that weighty question: “There are some nice shops in the area.” Like a butterfly, the show lights on a subject and takes in a little nectar before flitting off to the next. The audience feels like it is experiencing a lifetime, rushing along like we’re on a rubber raft helplessly careening off rocks through the rapids. The show is filled with non-sequiturs (“The thought of you disgusts me … I do care”), fun with the language (“I wanted to leave before I was left”; “You saw someone who was trying – a trying man”), sometimes needlessly graphic descriptions (a dog’s being electrocuted) and various themes. Fear. Despair. Anger (“I’m disgusted with myself, so I lash out. Or lash in”). Self-loathing. Other-loathing. Confusion. And mainly, why am I here? Why are we here? Should we care? The show is physically challenging, not only because Thom is on stage for about 75 minutes, but also because he must maintain a high level of energy and utilize a whole tool chest of acting skills. Magoon is definitely up to the challenge. 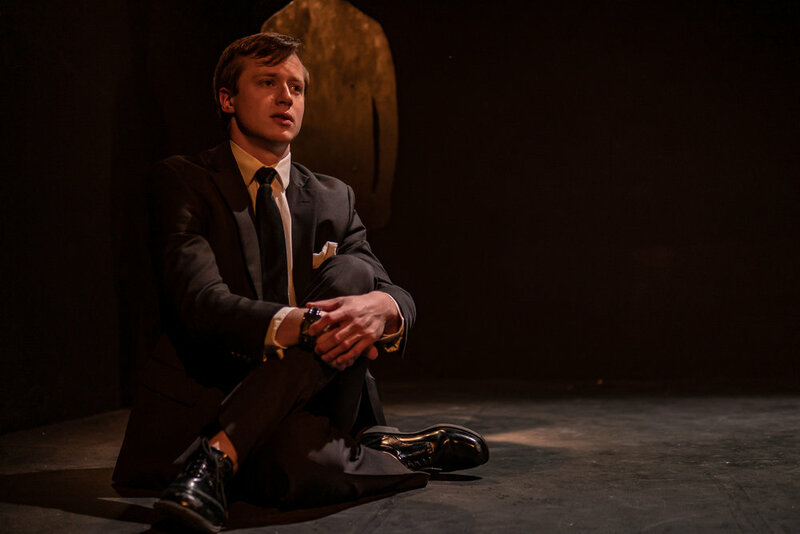 In a black suit, tie and shoes and white shirt, Magoon looks like an everyman, or somebody from the cast of “Men in Black.” He tells his story with a sort of detachment – almost like he’s looking in a mirror -- but often engages the audience. He fixes upon a woman, saying, “You look different. Where are you from?” He brings a man onstage from the audience – and then ignores him. His thoughts are like smoke, drifting away to make way for a new rambling. Magoon’s Thom feels at times like he’s exorcising demons, his eyes tautly searching the audience for answers. At other times he’s serene, a knowing quiet on his face, like he’s figured something out. Yet, there is always an edge of energy. The show opens in the dark, its only character trying futilely to light a cigarette before lighting on a dictionary where he tries to define certain words. It is rather uncomfortable for an audience to be totally in the dark, an uneasiness that pervades the whole show. This is not a play that has the usual story arc, that points the audience in one direction that viewers can easily stroll along. Magoon can get quiet and reverential (“I’m speaking softly again because I want to be heard”), stalk about in tirades, flip around like a fish on the floor as he is supposedly stung by bees, he thinks are there to help him. He makes use of the entire room, heading over to the bar to take a seat, scrambling to every corner of the stage to tell his story. It is exhilarating, at times; exhausting at others. When Magoon makes the final assessment: “I had promise. What was I so afraid of?” it is a question that lingers in the air. There is no doubt “Thom Pain” creates lots of after show discussion. “Thom Pain” was presented March 20-23 in the Underground Collaborative, 161 W. Wisconsin Ave., Milwaukee.